The Other Guys delivers some decent laughs and features strong comic performances from Ferrell and Wahlberg, but it's also overlong, uneven and guilty of putting all the best gags in the trailers. Directed by Adam McKay, The Other Guys stars Will Ferrell and Mark Wahlberg as New York desk-jockey cops Gamble and Hoitz, who are constantly overshadowed by the department's action movie-style supercops Highsmith and Danson (Samuel L. Jackson and Dwayne Johnson). However, when Gamble and Hoitz arrest millionaire investor David Ershon (Steve Coogan) for a minor offence, they inadvertently stumble upon a huge case involving fraud, corruption and money laundering and with the flashy supercops accidentally putting themselves out of the picture, it's up to the 'other guys' to step up and save the day. 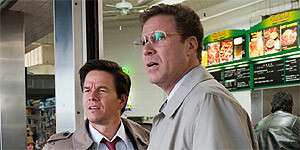 Ferrell and Wahlberg make an engaging onscreen duo and spark off each other to amusing effect, particularly during the film's best verbal gag, an argument about who would win in a fight between a lion and a tuna. There's also strong comic support from Jackson and Johnson (a spin-off movie waiting to happen), Keaton (as their TLC-quoting captain who moonlights in a department store), Coogan (underplaying it, to good effect) and Eva Mendes, who's excellent as Gamble's unfeasibly hot wife. The script has several funny riffs on the excesses (car chases, explosions) and cliches (“good cop, bad cop”) of the action-cop genre, as well as several good sight gags, e.g. Keaton delivering a motivational 'Let's get out there' speech to his department store employees. That said, it's fair to say that not all the jokes find their targets, particularly a running gag about the resurfacing of Gamble's college alter-ego, a pimp named Gator. The film is also guilty of putting all its best jokes in the various trailers and the first half of the film is much funnier than the second. On top of that, the script is frequently uneven and inconsistent (Ferrell's character is an idiot in some scenes and the smart one in others) and it's also bogged down by a needlessly complicated, slow-moving plot. The film also has weird Michael Moore-style info-credits at the end, lecturing on Ponzi schemes and the financial crisis, suggesting either a misguided (if well-intentioned) agenda or a joke that falls horribly flat. The Other Guys has some very funny moments but it's also patchy, uneven and overlong. Worth seeing but it's no Talladega Nights.